CD review: "The Muppet Show: The 25th Anniversary Collection"
This review first appeared in the Winter 2002 issue of Turbula. When "The Muppet Show" debuted in 1976, it seemed something new and fresh. These were puppets starring in a prime-time television show. In truth, "The Muppet Show" marked the end of an era. It was the last variety show on television. Carol Burnett would soon be leaving the air, and the kind of unscripted entertainment that had originally made TV as creative a medium as any was coming to a close. So if "The Muppet Show" wasn't really anything new in '76 (nor unknown, either, but familiar faces from "Sesame Street" and frequent television talk show appearances), it was still fresh. Well-written, too, and with a kind of manic fun that hadn't been seen since the heyday of Milton Berle and Sid Caesar. Jim Henson had created the Muppets for a local Washington, D.C. TV station back in 1955, and from the beginning they sang more than they talked. That held true on "Sesame Street," and certainly was true of "The Muppet Show." Most particularly, it's true of the new "25th Anniversary Collection" from Rhino. 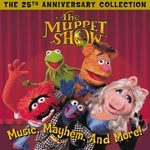 Covering the various Muppet film soundtracks as well as the two albums drawn from the television series, the "25th Anniversary Collection" includes only a few of the skits from the two TV show albums. The songs themselves are a strong cross-section of the material from the shows. From a cover of Randy Newman's "Simon Smith and His Amazing Dancing Bear" to the now famed "Mahna Mahna" to Kermit's theme song, "Bein' Green," these are the songs that helped define the Muppets in the public's mind. What's missing, though, are the skits that also defined the show - and that were included on the original TV series albums. No Veterinarian's Hospital, no Pigs in Space. There's one stand-up routine by Fozzie Bear, and that's about the only non-singing track included. But with more than an hour of music, it's pretty hard to complain about what isn't here - especially since there is so much that is pure magic.